Five years ago today, I posted this on Facebook. This morning, as I’m working on a couple of class plans for yoga teacher training and thinking about what I’m teaching for my Tuesday morning class and contemplating what it’s going to be like when I don’t have to work at CSU anymore, it felt worth reposting. Woke up at 4:30 am like normal, but decided to go back to sleep, and you know how you have the weirdest dreams when you do that? I had one that I was teaching at Chemeketa Community College, a class about “Finding Your Purpose,” and I showed up for week three completely unprepared. We were in the Student Center, and it was busy and noisy — a spin class, the food court, all kinds of other classes and study groups and students just hanging out — and there was no privacy. I also realized that rather than a 10 week progressive course with the same group of students, the class was actually a drop in, which meant I should be doing what I did the first week over again, but I didn’t have those notes. I asked my students to put their chairs in a circle to provide a container of sorts, but I had to go find my own chair. All of the furniture was old and broken down, no good, so the chair I had to settle for was awful. When I got back to the group, I was honest, told them I was struggling with the distraction, my own lack of preparation, was irritated and fumbling, but that I was doing my best and would keep going, was showing up, fully present. Then it came to me that it was the perfect teaching moment, and told them that it was just like that with finding your purpose — it isn’t just about figuring out what you want, but dealing with the obstacles that exist, that you can’t control all the elements, there’s the environment, culture, other people, economic realities, potential health issues or physical limitations, and that you have to learn to work with them. I ended up rocking what was a messed up situation. Take that subconscious — clearly if you want to give me an anxiety dream, teaching can no longer be your subject matter. Time to go back to the old standards of not being able to find a clean or private public bathroom when I need to poop, or the one where I’m out jogging and cars are honking at me and I look down and realize I’m completely naked and miles from home. This entry was posted in Uncategorized on December 1, 2018 by jillsalahub. I quit my CSU job today. No kidding, I quit my job. Well, technically I gave nine months’ notice, will finish this academic year (my 19th at CSU!) before I’m gone for good. It is such a relief to finally get to tell you! I’ve been hinting at it, but wasn’t able to say anything here until I made it official. And today, my first day back after summer vacation, I made it official. I had already told my boss when I left for summer break that I was going to spend my time away considering what I might do next, how I wanted to spend the next 10 or 15 years, so she wasn’t surprised. It’s been clear to me for a long time that it was time for something else. In fact, I never planned to stay at CSU in the first place. I meant to get my graduate degree and move on, but since we settled here, bought a house, and what else I might do besides the vague “be a writer” wasn’t clear, I stayed. My plan is to focus more on writing and teaching. I’ll be blogging more, working on finishing at least one of the books I’ve been working on for years, and being more serious about sending things out for publication. I’ll be teaching, both in person and online – yoga, writing, and meditation. I already have a plan for some online classes, “Cultivating Practice” and “Wabi-Sabi for Writers” will be two of the first, as well as teaching some regular group writing practice courses. I’m going to continue to teach in person locally, as well as offering private online and in person meditation instruction. My other intention is to focus even more on social justice action. I’m not sure exactly what this will look like, but one thing I want to offer is yoga for bigger bodies, which doesn’t even exist where I live. The other ways this might manifest is simply by having more time to do more work with local initiatives and issues. I want to add one important note: I’m only able to do this because my husband has a job he loves that pays well enough that I don’t have to keep my salary and benefits. This opportunity is all about privilege. I’m aware of mine, grateful for it, and intend to use it to ease suffering, in myself and in the world. This entry was posted in Uncategorized on August 15, 2018 by jillsalahub. 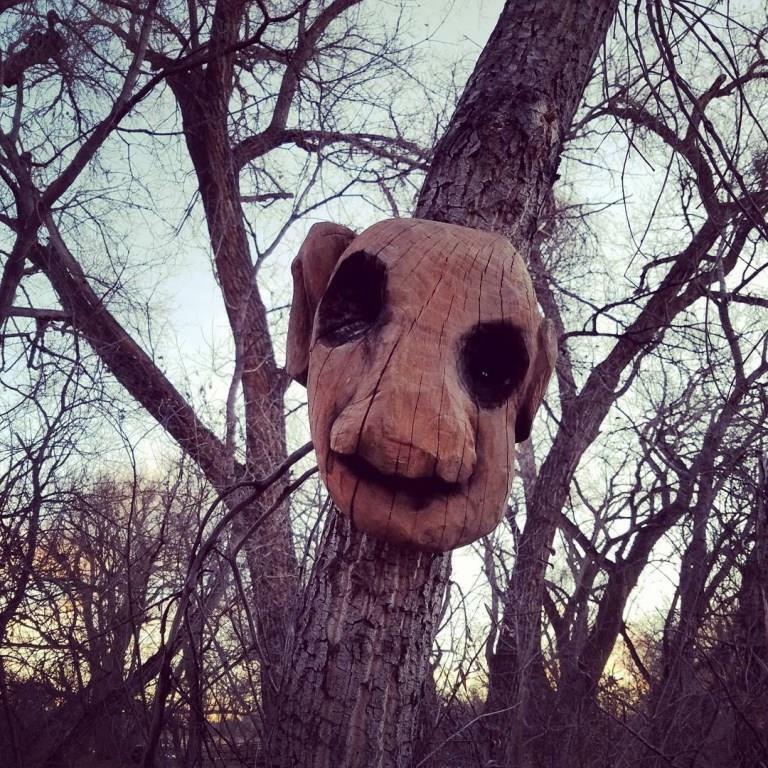 When we were on our morning walk earlier this week, Eric told me, “come down this way and take a picture.” In the spot where a makeshift memorial had been removed by the park services people, a strange face was hanging from one of the trees, some kind of mask or tree spirit. He’d wanted to take a picture of it earlier in the week, but it had been too cold to stop. He hadn’t told me about it because how would you even explain such a thing. I don’t know. 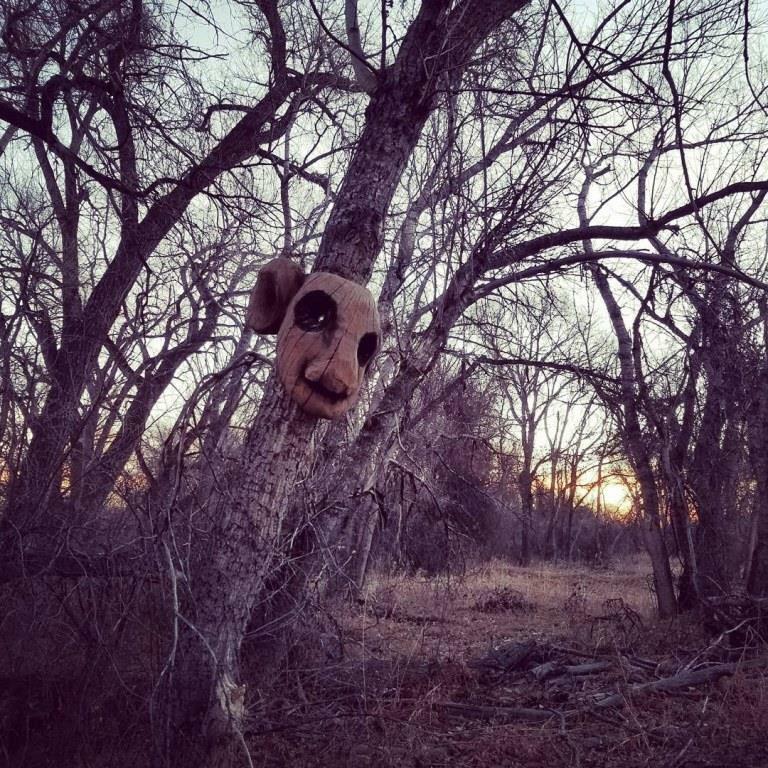 I don’t know what it is, and I don’t know how you’d explain it, and I don’t know who put it there or why. There’s so much I don’t know, about everything. Not knowing is a characteristic of wisdom and compassion. Instead of stepping in to give advice or offer your opinion, you stay with the quality of uncertainty. I forget this sometimes. I’m so quick to want to fix whatever is wrong that I speed towards knowing and being sure, to action, when maybe it’s better to be patient, to simply be present until I’m sure or until someone asks me for a specific kind of help. Last week, one of my favorite dog people went through something horrific. She was out hiking with her dogs when one of them disappeared. Afraid he’d gone over the cliff where they were hiking, (he had), they stayed out looking for him as it got dark. They could hear him, but weren’t sure where he was, and it turns out they couldn’t have gotten to him anyway. I was glued to Facebook the next morning as someone flew a drone along the cliff, located him, and then a member of search and rescue rappelled down the cliff and retrieved him. See more about the amazing rescue here, here, here, and here. The next day, with everyone home and safe, she posted a picture of them out for a walk, with a caption that mentioned something about the trauma of the day before, of the relief and gratitude they were feeling. Someone chose that moment, barely 24 hours after the drama and terror, to criticize her for walking her dogs off-lead. And when someone else stepped in and called her out for being inappropriate, she doubled down and restated the supremacy of the truth of her experience. It also reminds me of the people I see outside of the Planned Parenthood, praying and holding signs that say, “Abortion is murder!” People get caught up debating politics or social issues, and in the process they allow their righteousness to override their compassion, their humanity. For starters, the people outside of the clinic with their posters and prayers are too late. The only thing you can accomplish at that moment, in that place, is to announce your rightness, to flaunt your opinion, and to add to the suffering of others. You aren’t helping. It’s not about your opinion on the issue. It’s about when and where it is appropriate to have the discussion — most certainly not with a woman who’s already made the decision and the appointment, or only 24 hours after someone’s dog has been rescued. Considering what she endured, both of them, it’s really not the time or place to share your opinion. And why do we think what is true for us has to be true for everyone else, a big T truth? I don’t make New Year’s resolutions, and yet, I do have intentions. In the coming year, may I practice right speech, may I be more compassionate, may I be comfortable not knowing, and may I continue to seek my own truth without needing it to be true for anyone else. This entry was posted in Uncategorized on December 30, 2017 by jillsalahub. 1. Savor is coming! Daily Practices for a more nourishing holiday from Rachel Cole, one of my favorite traditions. 2. Good stuff from Austin Kleon: September notebooks (excerpts) and 30-day challenge. 3. 7 Ways for Introverts and HSPs to Beat the Winter Blues. 5. 52 Mondays: The Backstory, shared by A Design So Vast. 7. Recipes I want to try: 6 High-Fiber Recipes and roasted yams and chickpeas with yogurt and graham crackers. Let’s just get real and admit I want to try every recipe from Smitten Kitchen. 11. Her family hired me as a maid for 12 years but then she stole my life and made it a Disney movie. This is the worst. 13. Mary J Blige: ‘I lost my gut and my gift. But I got it back.’ “The R&B singer turned actor tells Rebecca Nicholson about her heartache, reborn hope, and why she sometimes needs to get away from herself.” I’ve mentioned before how much I love Solange’s “A Seat at The Table” and SZA’s “Ctrl.” Mary J. Blige’s “What’s the 411?” was that album for me in 1992. She’s amazing. 15. The Moth. “Arts organization The Moth was founded in 1997, and has surfaced thousands of people’s stories through hundreds of live shows. Each show has its own theme, and each story is unique.” We went to a live event last night, and the story Dylan Park told BROKE me. This entry was posted in Uncategorized on November 6, 2017 by jillsalahub. I wrote on the card I gave Eric this morning: “24 years?! How does that even happen? How does it happen SO FAST? !” I have no answers for this. Here we are, just living our lives like it’s no big deal — making each other laugh, getting irritated about stupid stuff that doesn’t even matter, doing the laundry and making dinner and walking the dogs — and suddenly we’ve been married for 24 years. At Chelsey and Jon’s wedding reception this weekend, Eric said, “do you think if we could go back to that day and relive it knowing everything was going to work out, we’d have enjoyed it more?” I said, “you didn’t enjoy our wedding?” He laughed and said that wasn’t what he meant, but rather he remembers being 24 and just starting out, anxious about how things were going to go, wondering if it was going to be okay. Here’s something else I’ve learned about a relationship: Okay, so it’s not what you think it’s going to be, the feelings are always changing, and you’re going to have to say goodbye someday. But when you find your love, there is something inside that simply and inexplicably says hello to him. Yes to him. Of course to him. Certainly. Obviously it’s you. There is no choice. I do. Today, 24 years in, I choose Eric again. I can’t help it. He’s my favorite. This entry was posted in Uncategorized on October 9, 2017 by jillsalahub. The first few weeks of my summer vacation, I did whatever I wanted. I slept in, watched a lot of TV, read, took long walks with Eric and the dogs, ate good food, took naps, went to aqua aerobics and yoga and Pilates, got a massage, had lunch with friends, wrote, meditated, got naked with Eric. Sure, I kept up with the laundry and the bills, but the big summer to-do list could wait. Then I went to Oregon for a week, spent the few days after I got back recovering and unpacking — reentry. Now it’s time to shift gears and tackle the list. My strategy is to do at least one thing a day. Yesterday it was actually two — cleaning off my desk and balancing the checkbook. So far today I’ve already done three loads of laundry, meditated, did my morning writing practice, and ate breakfast, but none of those things are on the list. Later, I’ll go to a yoga class and a Pilates session, but those aren’t on the list either. I’ll take a shower when I get back, maybe a nap or read some more of Sherman Alexie’s new book, see if Eric wants to get naked with me — also not on the list. On the list: Painting the outside of the house, repairing and repainting the spots on our drywall where they put in insulation, calling the insurance company about the damage on the door of my still-feels-new-to-me-but-is-actually-more-than-a-year-old car, making an appointment to take it in to get fixed (along with a few other things it needs), dust the living room, get a haircut, clean around the dog beds, work on some tasks from the classes I never finished, mail stuff to a friend, and swap out our modem for the new one they sent us months ago. Other things are happening too, a new furnace and a new fence, but Eric is taking care of those. I’m not sure exactly what my point is. Maybe it’s just me checking back in, dipping my toe in, saying “hello” and this is where I’m at, what I’m doing, but even this isn’t the whole story. I’ve written you many times in my head, but haven’t been publishing much — that is on the list too. This entry was posted in Uncategorized on July 18, 2017 by jillsalahub. This entry was posted in Uncategorized and tagged Pema Chödrön on July 16, 2017 by jillsalahub.